Wristwatches are a gadget which, technically speaking, none of us need any more, but we (like many of you) can’t seem to give them up. The correct time is readily available from our cell phone, Blackberry, or any number of other gadgets we carry with us. However, if we were only allowed to have one gadget on a desert island, a wristwatch would seriously be considered. Well, either a wristwatch or a good multi-tool. If it was going to be a wristwatch, we would want it to have an “adventure-ready” strap: comfortable to wear, able to handle harsh conditions, and looks great all the time. 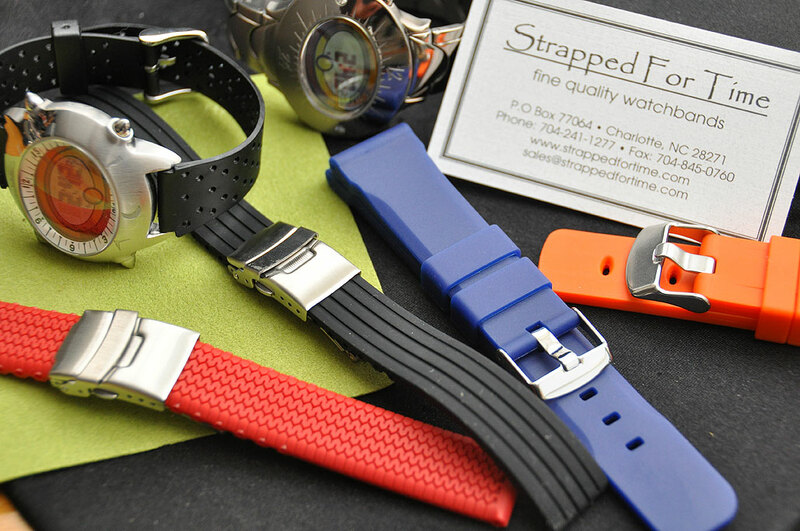 The place to go to find such straps is StrappedForTime. They have a huge selection of styles that can turn any watch into an adventure-ready watch. One can choose amongst waterproof leather bands, military-style bands, and a host of other materials and styles. We picked a few great looking rubber ones to see which would work best with our YES Tati and Cozmo watches for this Summer. The YES watches (Tati, Cozmo) came with diver bands. They work just fine but never felt quite right. The Tati/Luna band was a bit on the thin side for our taste, and the Cozmo band was very stiff. We wanted to update them with something more comfortable for extended wear. 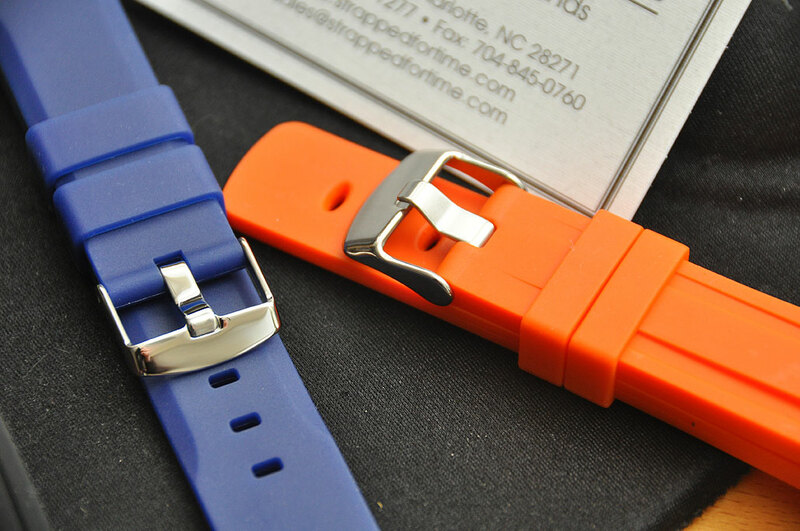 For comfort, it is hard to beat silicone, and StrappedForTime has a great selection of them. The only downside is that silicone bands tend to pick up linteasier than other materials. If that bothers you, just avoid the black ones and get some other color. Besides, these bands will be getting wet and dirty, so what’s a little lint? We have done plenty of articles on how to change bands, so we’ll not repeat the steps here. We do want to show some before/after shots of the watch after swap. The strap we chose for the Tati is the grooved black rubber strap ($25). It is smooth on one side and grooved on the other, very flexible, and perfectly sized for the Tati. It also has a brushed stainless steel flip-lock clasp with a push button locking closure. We think the 4.5mm band looks much nicer with the thicker lugs of the Tati than the thinner OEMband. The YES Cozmo has a much thicker case, so we paired it with a heavier 7mm thick silicone band. The Cozmo has a nice blue accent on the bezel so a blue band would bring that out nicely. We chose the orange band both for the great color and to make everything appear lighter. StrappedForTime did not have the exact size we needed so got the closest size up and trimmed it to fit, something which can’t be done with leather straps. Changing the strap of your favorite watch is a perfect way to give it a new look, a different feel, and get it prepped for new activities. Even if you sit behind a desk all day long, your watch can be ready when adventure calls. Be prepared. The call is coming.